- and only two sold since then. You'll understand the need for private communication by IM or email - nothing cloak and dagger, I just don't wish to publish my postal address here (though it does in fact appear in the MV members-only archives on the Website). We'd love to see you and your son at the show, so drop me an IM, or an email if you prefer, and I'll respond with the info you need. This is a query which is probably one for Snoopy if he's coming to ThoD (because he always takes good photos!). I remember after one concert some photos appeared of the post-gig gathering with people's names which miraculously appeared when you hovered the mouse over. I was wondering if we could have something similar for ThoD so that some of us could do a bit of identification homework (and stop accosting total strangers at gigs). I'm not suggesting a photo like we had at school. Anyone who didn't want to be identified could of course stay anonymous. Probably the easiest way to do this would be to put the relevant photos in the Facebook group, that way people can tag themselves and anyone else they know. I'll try and remember to do that after the event. I've now added a promotion for this event to the Smash Flops front page at http://www.peteatkin.com/pa.htm#gigs. There's also a dedicated temporary e-mail address, lantern@midnightvoices.com, where even non-members can contact Carole for bookings. Also a seat availability counter and a link to a Google map showing the Lantern Theatre and the (ex-Marriott) Kenwood Park Hotel where we're holding the post-gig reception. Tickets have been printed and laminated, and will be mailed out this week to all those who've so far booked, paid and included an SAE. If you can't remember whether you completed your booking, drop Carole a line. Just 30 tickets remain unsold for the Lantern event -- not such a rush as in 2006, not yet anyway, but Carole is confident of a sell-out. I'll follow up this post with a more general plug with all the right keywords to register on a relevant Google blog search. All paid-for tickets have just gone in the post. Depending on the variety of stamp you affixed, you should get them sooner, or later. 'Smart' usually implies 'Wrong'. So it is with Google Maps. 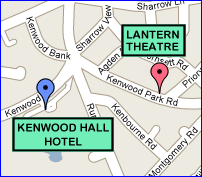 Since I created the map page showing the precise locations of the Lantern Theatre and the Kenwood Hall Hotel, the Googlemonster has realised that it has other entries for these venues, and has cleverly added them to my page. These are the ones with photos, marked 'unverified listing', locations 'A' and 'D' as I open the page today. But they're wrong -- they direct you only to the centre of the postcode, not the actual building! If you don't know the area and you're using the map for navigation, please be sure to note the two entries bearing my name and no photo. They are the correct ones. Full interactive map including real and spurious locations here. Only 15 days to go to the MV event of the year. Disappointingly (understatement) there are still tickets available - see Smash Flops front page for up-to-date count. A big thankyou to all who have supported this event and booked their tickets already. What I need now is for those last tickets to be sold. If you haven't booked because you think it's bound to come around again in the future, don't be too sure. If I can't even sell out an 84-seat venue now, it's unlikely I'll be enthused to fail to sell out next time, or even feel like asking Pete. So, once again, I'm encouraging all who haven't booked and could attend to do so quickly. It will be a great night in a wonderful venue. I think this link should hide the offending entries. By this time next week it will all be over! All tickets booked since the 11th will be available for collection on the door. The door will be 'manned' this time by the inestimable Jan and Nedd, so everyone please check in upon arrival. I've been a reader of the forum for a while and I have now done the sensible thing and joined it ! Please humour a newbie and tell me what does ThOD stand for ? Really looking forward to Saturday night at The Lantern. Many thanks to Carole and Steve (and of course Pete) for making it possible. ThoD stands for Theatre of Dreams. I don't think I've missed any out. I'm checking the tickets with Nedd. The first concert was 16th August 1997 - I only know that because it was just 2 days after my second daughter was born, so I felt I couldn't really get away with allow myself a trip to Monyash! Thanks for the explanation Jan and Simon ! Am I worthy to mix with such luminaries ? At least I did get to Hove in April, thanks to the information provided by this forum and the website. Saturday promises to be an excellent ThOD II - the sequel. Hey Snoopy your map link (without offending items) brings up Canada now! Huh! Google seems to have changed it again. Try this one -- it's getting late now, but I'll ask Snoopy to investigate tomorrow. Advice needed. I shall be coming across from Manchester (dropping my middle son off for his first semester at Manchester Uni). Google maps suggests three possible routes: the A57 (snake path), the A623 or the A628. Any suggestions about the best one to take?